Okay, I have to say that one of my favorite things about Facebook is that it is almost like experiencing day-to-day life with my friends. After all, Robin-the-Artist could have told me this story, but it wouldn't have nearly the punch that it did in seeing the picture. 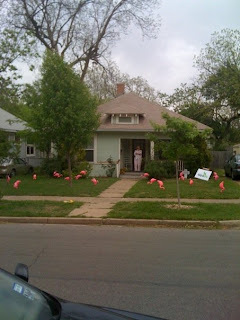 It seems that Robin was "flamingoed" by her Young Life group. Robin, it couldn't have happend to a cooler more creative person, and it absolutely made my day that I got to see it. Tell the YL crew they rock.